If you have just heard the sirens and are wondering WTF! They are a tsunami warning for Numazu. There is an estimated 0.5m tsunami for the coast of Japan due to a 8.0 Magnitude earthquake in the Pacific Ocean near Indonesia. Tsunami walls are several meters high, so there is little to worry about unless you are on the beaches in which case evacuate to higher ground beyond the tsunami wall immediately. Stay safe and follow the lead of the locals. Everything seems safe. That last siren you heard was a tsunami warning for a 50cm tsunami. Apparently the warning period with begin from around 11:30pm. The tsunami appears to be as a result of a magnitude 7.9 earthquake off the coast of the Philippines. According to the JMA website the Tsunami warning is set to ‘advisory’. How would you like to wrap your lips around our delicious sausages? Baird Brewing will be holding the Fishmarket Taprooms 12th year anniversary celebrations this coming weekend from July 20-22. This a massive weekend with great food and Baird Brewing’s finest beer. There will be brewery tours and a BBQ at the brewery. Te brewery BBQ will be from 1:00-5 or 6:00pm and the taproom will be open from 1pm til midnight. All food and beer will be 500yen and you will be able to get a special 5,000yen card for the celebrations that will entitle you to 12 items plus a Baird Brewing Glass. Awesome deal. 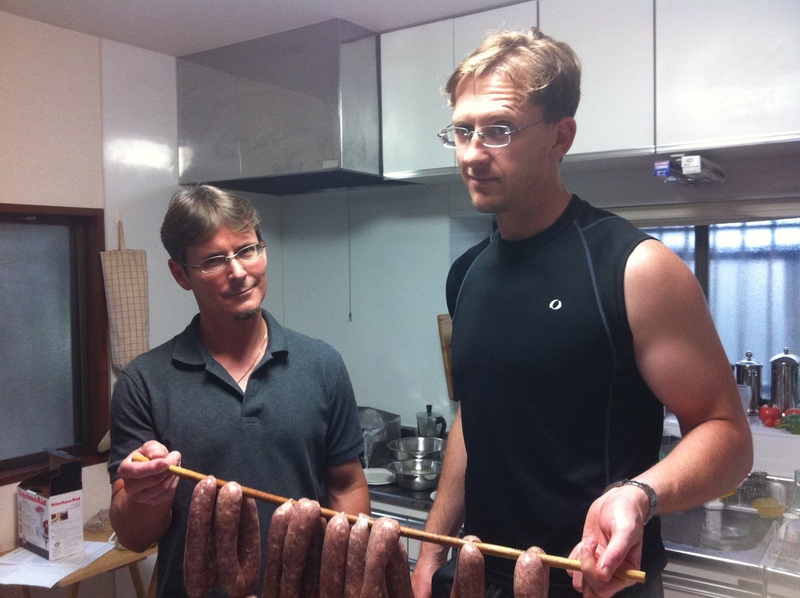 Fishmarket Taproom manager ‘Cajun’ Chris and I have made some amazing sausages for the celebrations. You can taste our deliscious sausages from Saturday July 21. I’ll even be there behind the BBQ. Be sure to ask for my sausage. One of the joys of Living in Numazu is that they have a Yamazaki Vinos. And one of the joys of the Yamazaki Vinos is the wine tasting. The Vinos in Numazu is in a sneaky little spot on the basement of the イーラde (Iira-de) department store snuggled into a corner of the Yamazaka grocery store. The cellar-like subdued lighting and sanded pine timbered walls stenciled with the shop name to look as if it had been branded creates an oasis from the surrounding supermarket. Getting a tasting is simple. Just rock on up to the counter and ask. There is a list of wines on display on the shelves behind the service counter and a plaque showing prices for tastings, glasses and the whole bottle. The wine list is carefully selected and only the better quality wines make it to the tasting list. Every time I have gone for a tasting there I have always experience quality. However, that quality doesn’t always come with a high price. The selection is expansive. Today’s selection varied from 150-1050 yen for a tasting or 350-2650yen a glass. Of course the more expensive wines are at the top end of the tasting cost and frequently retail for around 10,000yen a bottle and taste like you have just drunk unicorn milk. 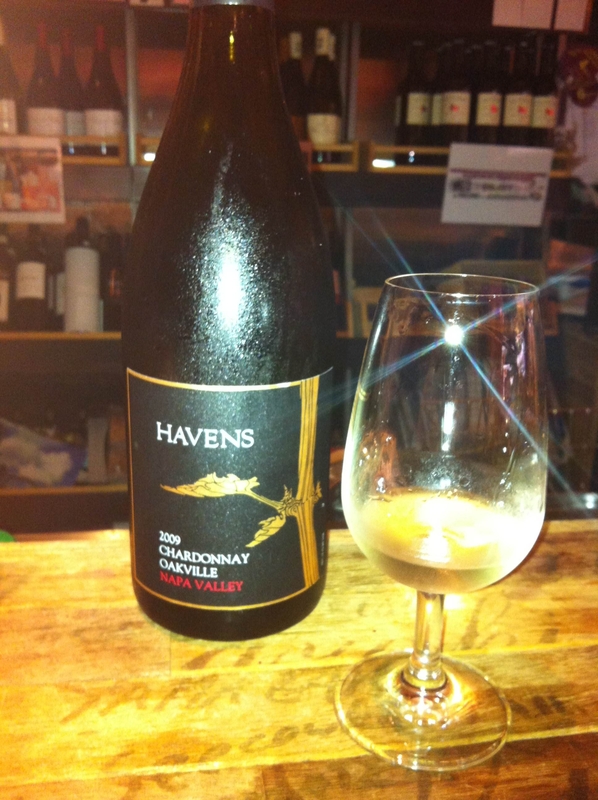 From today’s tasting my hands down, pants off favourite was the Havens 2009 Chardonay Oakville from the Nappa Valley. This creamy Chardonnay was rich in vanilla with subtle notes of cinnamon and peach. It combined perfectly with their European cheese platter from their fromagere in Shizuoka. There are a dozen other snacks on the menu to accompany your tasting. The tastings average around 600yen a plate. The staff know their stuff too. While I was there I noted the staff guiding customers with their recommendations and offering wines in different styles and price ranges to satisfy them. However, I did make the mistake of commenting about one particularly good tasting only to have the wine seller animatedly tell me all about it. This would have been fascinating had I understood a word he had said. Yamazaki Vinos is not exclusive to Numazu. It is actually part of a high end supermarket business with several chain stores. The prefecture capital, Shizuoka, has two Vinos that I have visited and also is home to the best fromagere I have found in Japan. English menu – No sorry but its pretty easy to figure out. Just point and say tasting or glass.